Ready to impress inside & out this Yardley home boasts 4 bedrooms, an expansive finished lower level & great outdoor living. 3700 Sq.ft. includes approx. 1100 sq.ft of finished basement. With the subtle contrast of classic red shudders against the brick fa~ade & a paver walkway leading to the waterfall doorstep you are welcomed inside through the spaciousness of a 2 story foyer that fills w/ light. You will find this home is enhanced w/ fine architectural details & beautiful hardwood floors throughout. Formal entertaining in the living & dining rooms offer an elegant appeal w/ a soft 2 tone d~cor w/ crisp white trim. Well appointed, the gourmet kitchen is centered around a freestanding island w/ breakfast bar, granite surfaces that reach through the backsplashes, SS appliances including induction oven, an abundance of raised oak cabinetry, pantry & a bright & airy adjoining breakfast area with skylight. An open site line through the Family Room offers views of the fireplace w/ handcrafted mantle. The skylights bring in soft infused sunlight & the warm hue gives this gathering space an inviting ambiance. Wrapping back to the foyer we come to double doors that reveal an office with shelving & accent lighting. Moving upstairs the open hallway leads to the owner's suite. This enormous bedroom w/ the continued hardwood floors creates a lovely start & end to each day. Features include a deep walk-in closet & an en-suite bath that gives you the luxurious relaxation effects of a jetted tub, double vanity & separate shower enclosure. 3 additional bedrooms are all sizable, enjoy double windows, ample closet space & share the common bath w/ double vanity & ceramic tiling. A vast casual entertaining area the lower level w/ luminous flooring connects a game room w/ pool table & glass door walk-out access to the backyard, a full wet bar has all the amenities an entertainer wishes for, a theater room w/ electric fireplace to add extra coziness. Extra resort style comforts include a full bath w/steam shower & a separate dry sauna. Outdoor living offers a sense of tranquility as the tiered deck overlooks a full tree line. A security system provides peace of mind & an irrigation system will keep your landscape green & lush. 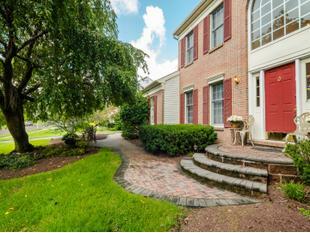 All of this is located in Meadowbrook, a quaint neighborhood in the Pennsbury School district. Easily accessible are local favorites such as Shady Brook Farms, 5 Mile Woods, Sesame Place, along with several options for shopping & restaurants.